Uncompensated care at hospitals is customarily defined as the combination of charity care and bad debt. Charity care refers to costs for patients with a demonstrated inability to pay. Bad debt includes unreimbursed costs that the hospital incurs for patients who were considered financially able to pay, or for whom the ability to pay was never determined. 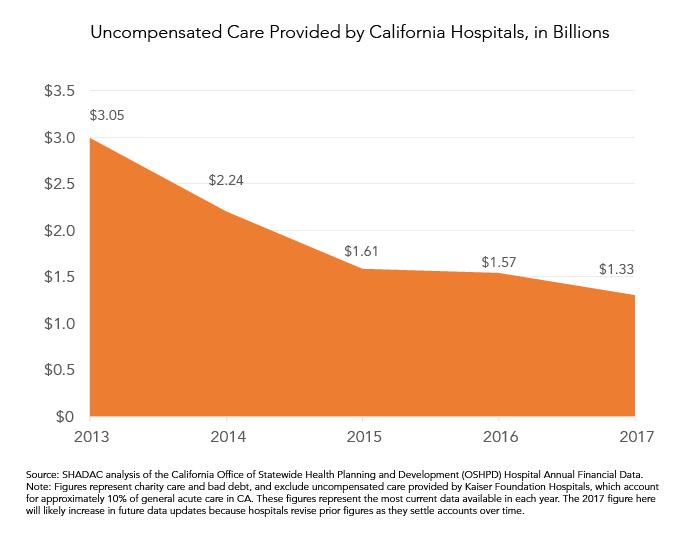 Since the full implementation of the Affordable Care Act (ACA) in 2014, the cost of uncompensated care at California hospitals has plummeted as more Californians have obtained coverage. CHCF Blog articles from 2017 and 2018 explored this unprecedented drop in uncompensated care in more detail. The most recent data from the California Office of Statewide Health Planning and Development (OSHPD) are available under Document Downloads. The figures have been updated by OSHPD since previous blogs were published; they represent the most current data available in each year. It is likely that the 2017 figure reported here will increase in future data updates because hospitals revise prior figures as they settle accounts over time. For example, more patients may be deemed eligible for charity care, and the amount of “uncompensated” care increases as hospitals determine that some bills will never be paid. In addition, data on the cost of uncompensated care have limitations. For example, the data from OSHPD do not include uncompensated care provided by Kaiser Foundation Health Plan and Hospitals, which account for roughly 10% of general acute hospital care in California. In addition, public program payments (such as Medi-Cal and Medicare) do not always cover the full costs of providing care, and uncompensated care measures do not reflect these shortfalls.